Climate change can dramatically affect the food web configuration of arthropod communities through its effects on species interactions. 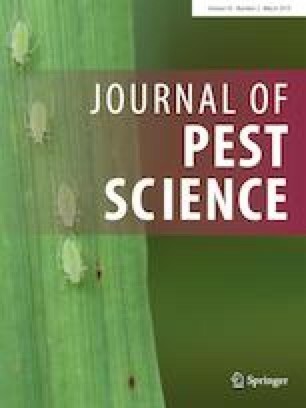 We have studied whether these effects could alter the probability of local extinction of three predatory mites naturally associated with the two-spotted spider mite, Tetranychus urticae, in citrus in Spain and, therefore, disrupt the biological control of this phytophagous mite. Laboratory and semi-field results provide evidence that the natural regulation of T. urticae in citrus can be seriously disrupted in a warmer future. On the one hand, T. urticae populations at conditions representative of future hotter and drier summers, could reach higher population densities than forecasted according to its demographic parameters. On the other hand, T. urticae regulation provided by its predators depended on the environmental conditions, was species-specific, and was affected by interspecific interactions. In some cases, one of the predatory mite species in the system could not be recovered. Because there is evidence that the composition of the community under scrutiny is highly sensitive to local habitat conditions, our results can be taken as evidence that local extinctions may occur more frequently in a warmer future and further contribute to an increasingly higher frequency of T. urticae outbreaks. Communicated by C. M. Benefer. The authors thank M. Piquer (UJI) and A. Sanz (UJI) for technical assistance and J. Calvo (KOPPERT BS, Spain) for supplying N. californicus. This study was partially funded by the Spanish Ministry of Economy and Competitiveness, MINECO, (Grants AGL2011-30538-C03-01 and AGL2014-55616-C3-3-R) and the Spanish Ministry of Science and Innovation, MCINN, (Grant EEBB-I-14-08555).